After hotel pickup from your selected hotel, depart Hamamatsucho Bus Terminal aboard your comfortable coach in the morning. Your knowledgeable guide provides informative commentary at each stop on your half-day tour, including several significant cultural sites in the city. Hop off the bus at Meiji Jingu Shrine for a 30-minute tour of Japan's most famous Shinto shrine, dedicated to the Emperor Meiji and his consort. Learn about Japan’s ancient religion as you visit the sanctuary, treasure house and other structures built of Japanese cypress with copper plates for the roofs. Your guide points out the National Diet Building — where sessions of the House of Representatives and the House of Councillors take place — en route to the Imperial Palace. Here you’ll find the stone foundation of an old Edo castle, which is all that remains of its central keep. Take a stroll through the impressive East Garden, just one among the vast Japanese gardens of the Imperial Palace, which features a tea pavilion, moats and stone walls. After 45 minutes of meandering, continue by coach to Nakamise shopping street, a colorful shopping arcade crammed with traditional food stands and souvenir shops. 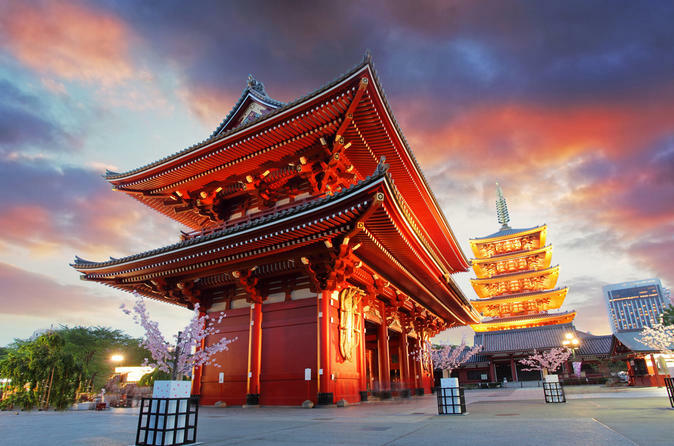 Walk with your guide along the promenade leading up to Asakusa Kannon Temple (also known as Senso-ji), Tokyo's oldest and most significant Buddhist temple dating back more than 1,300 years. Admire the golden image of Kannon, the Buddhist Goddess of Mercy, before you’re driven through the famous Ginza shopping district, Tokyo's most celebrated shopping and amusement area. Here, you'll take part in a traditional Japanese dance activity, where your half-day tour concludes in this fun neighborhood. Note: On Mondays, Fridays and other days when the Imperial Palace East Garden is closed, the tour will visit the Imperial Palace Plaza instead.